Panda Culture Conference One main purpose of this trip was for Suzanne to attend the Panda Culture Conference and the Grand Opening and Ribbon Cutting Ceremony for the new Museum of Art for Ecology & Calligraphy for the Panda. Suzanne along with many prominent Chinese artists, authors, and calligraphers spoke at the conference regarding their interest in and love for the panda and how various disciplines could work together for Conservation efforts to help save the pandas. The conference was hosted by the State Forestry Department of China, China Wildlife Association (CWCA), China Green Foundation Artist Ecological Society and China Conservation and Research Center for the Giant Panda (CCRCGP). 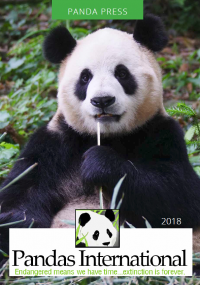 Suzanne was recognized for her work with the pandas and received an Honor Certificate saying: “Suzanne Braden- We appreciate to Pandas International presented by you for your long-term caring and supporting of the giant panda conservation career. Expressly award Mrs. Suzanne Braden the “Giant Pandas International Caring People Outstanding Contribution Award”, presented by CWCA and CCRCGP Museum of Art for Ecology & Calligraphy for the Panda Many local officials, Forestry Service officers and national media attended the opening ribbon cutting ceremony for the Museum of Art for Ecology & Calligraphy for the Panda. The Museum is dedicated to art and calligraphy focused on pandas. Taylor Celebrates Her 9th Birthday Panda Style! Taylor had a Panda themed party for her 9th birthday. She asked her friends to donate to save the pandas in place of gifts. We ordered the party pack from Pandas International and she was able to raise $318. She wanted to add her own money to that so we are donating $425. The party was a great success. Her big brother dressed up as a panda and we had panda-themed everything: panda pinata, panda cake, etc. Taylor hopes that her donation will make a difference for the pandas. Thank you Taylor! Your donation is definitely already making a difference in helping to purchase formula for the cubs in China. In lieu of birthday presents at her Star Wars Science party, Charlee asked her friends to bring donations for Pennies for Pandas. At first, she wanted to help the Ewoks, but decided to help real creatures instead. Her friends and family members came with pennies, money, more pennies, and more money. She even had friends from CA and HI make donations to her service project. In the end, Charlee’s penny drive raised over $200 for Pandas International. Charlee has a big heart and wants to make this world a better place. She has learned that every little bit counts, even for these pandas. Charlee, we think you are a special little girl. Thanks for your help! The 16th Annual Chinese New Year Dinner, held one week ago, was a great success. With over 130 people in attendance, it was a celebration to be sure. The silent auction proved to be as popular as ever with more than 100 items donated from over 40 different businesses and individuals. A few bidding wars closed out the auction, but it was all smiles as the winners claimed their items at the end of the evening. The room looked fabulous. Traditional red envelopes graced each place setting along with a menu of the evening's fabulous food, information about Pandas International, and activities for the younger crowd. The staff at Min J outdid themselves as usual providing not only an incredibly delicious dinner, but professional courteous service all evening long. We'd like to thank our table sponsors for their generous support - 360dwellings Real Estate, Campaign Products of the Rockies, Becker Stowe Partners LLC, Richard and Peg Brown, Friendship Force, Maggie & Mitch Morrissey, Pinnacle Plus Financial, and Pulaski Bank. Suzanne gave a fabulous overview of the important work we do at Pandas International with highlights of CCRCGP and even managed to sneak the infamous sneezing panda video into her talk. The highlight of the evening, was the incredible Lion Dance performance by Shaolin Hung Mei Kung Fu. The little ones and the adults were entranced by the acrobatics, the colors, and the drums. We apologize if anyone is still finding shredded lettuce in their hair! We'd like to give a HUGE thank you to our dinner sponsors. Our gold sponsors, Gift Republic and Tsingtao, and our bronze sponsors, Fairfields and Woods P.C., Panda Energy, and Spirit Hoods. We are so appreciative of all that you do. Finally, we'll leave you with a few photos of our guests showing their support of PI (and a little silliness as well). Alexa just celebrated her tenth birthday! She lives in Sagamore Beach, MA and has a passion for acting and animals. When asked what she wanted to do for her birthday celebration this year, she requested a red carpet event and asked that in lieu of gifts, VIP guests could bring a donation for Pandas International. Pandas are her favorite animal and she wanted her party to be an opportunity to make a difference in enhancing and saving the lives of the Giant Pandas. She is proud to have raised $275.00! Thank you, Alexa! We appreciate you! There are two second-graders in California who love pandas. They learned about pandas in school and created a slide show to share their knowledge of Pandas with guests at their school’s Open House. They also made a beautiful Panda mural to show Pandas in their natural habitat. The children set up a ‘Pennies for Pandas’ table and raised $75.00 for Pandas International. Thank you to these wonderful Panda Protectors! Piper recently held a dance party in which she encouraged the attendees to donate to Pandas International to help the Giant Pandas. Her friends and family helped her to raise over $100 for the Pandas. They all enjoyed a wonderful evening of dancing and helping a great cause at the same time! Piper also helps to run a panda club at her school. All of her friends from the panda club came to her birthday as well. Thank you Piper for helping to raise awareness about the Giant Pandas cause and raising donations too!